The Cat on My Head’s Cooper Murphy takes a winking Sunday Selfie. I snapped this selfie for you while I was helping and snoopervising Mom as she hung the Christmas garland. As I have little to say today, it is time for you to post your selfie and hop around to visit some of the other bloggers who have joined us. Of course, Mom asked me to print that list of “stuff” about hopping, so here it is. * Mom Janet here: I’m certain you know that Cooper Murphy wasn’t winking. He doesn’t have the eye “icks,” but he has been experiencing some off-and-on issues with drainage. Neither he nor I wanted anyone to worry about him. Have a terrific easy Sunday. Aww, what a very festive selfie! Ooh that is a very nice before the garland goes up photo. It looks like you had your work cut out for you to put up that garland, but I’m sure it will look amazing when you’re done. Your mom is lucky to have your expertise. Winks. Isn’t it super fun to help the humans put up the Christmas decorations, Cooper Murphy? The kitties here sure think it’s fun. Especially Tonks. She literally could not even wait for the tree to be assembled before climbing it. Purrs and prayers! Though, I do hopes you icks are gone soon, that can really hinder the clear watchin’ of Burdie TeeVees! Cooper, you look fantastic surrounded by all those Christmas colors. Is Christmas not exciting Cooper Murphy??? Even though Mom has been working hard, she DID bring the Christmas Boxes upstairs! This is so furry exciting! Me and Ninja have been smelling them all over! I bet you guys are excitied too! Cooper, we think you’ve done a fine job! Thank you and your whole family for your sweet thoughts about Caroline. William’s Kith & Kin recently posted…Dear Friends. You make the purrfect little snoopervisor! Cooper, great that you’re snoopervising, humans do appuureciate the help, although they sometimes pretend we’re in the way. Thank your mom for her kinds words on our blog about the loss of our old grandpa cat Angel Earl Grey. Raz is snoopervising in his Selfie today too! Cooper that was a fine selfie! Wink and all!! We are sorry to have missed a few sun selfies we are having computer problems and after a little bit on the computer Mom just gives up, it’s too aggravating for her. But we were able to post this week! YAY! You are lookin guud today! Pleese ask Aunty to do THE linky thing for mee an Thankx! Sherri-Ellen T-D. recently posted…BellaDharma’ss ‘no selfiess pleese’ selfiess! Or how to do an ‘out take’! You are doing a very good job of snoopervising, Cooper Murphy. Good job, Cooper. Every cat knows that humans cant put up Christmas decorations without a snoopervisor. What a cute selfie, Cooper Murphy. We bet you were a huge help with the garland. This is a most wonderful selfie Cooper Murphy! Very good job of snoopervising! 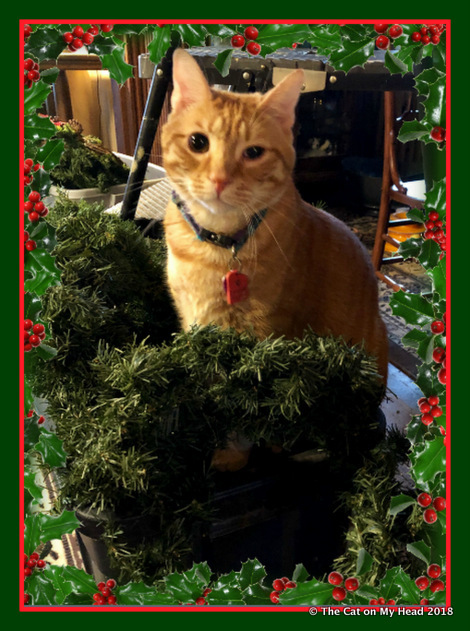 Pam Greer recently posted…Coco Kitty and Her First Christmas! Purrseidon here – Purrfect selfie for the Christmas holiday season! We love the Christmas theme – we’re doing that at our blog today, too! Sunday purrs from Deb and the Zee/Zoey gang. Surrounded by Christmas themes and looking awesome, too! Cooper you did a nice job posing for your Mom right in the middle of the garland! I bet you all have been watching all that decorating and thinking “what’s going on? ?” – well Santa Paws is coming soon. I am glad you don’t have the “icks” but I’m sorry your eye is a little weepy. I hope it clears up soon so you can keep a close eye on your Mom’s decorating around there AND the construction! Eye ick or not, you still look festive, Cooper Murphy! You look totally charming young man. We love your wink! What fun to help out with all the decorating! Oopsie, I used the wrong link, MOL! Nice job snoopervising Mom Janet, Cooper Murphy. You have to make sure the humans do a good job with the decorating, for sure. We hope your eye icks clear up soon. Weepy eyes are tough. Hugs and love!